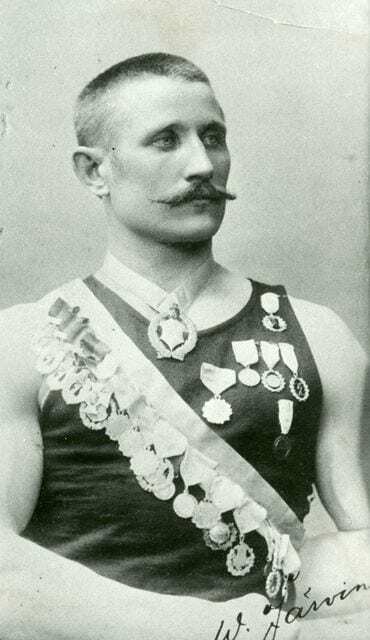 Verner Järvinen was the first Finnish Olympic champion in track and field athletics. Railway worker Verner Järvinen was already known as a famous strongman when modern sports arrived in Finland in the first decade of the 20th century. In 1906 he travelled to the Intercalated Olympic Games in Athens, where he won gold in Ancient style discus throw and bronze in the modern discus event. Two years later in London Järvinen took Olympic bronze in the Ancient style discus competition. These were Finland’s first Olympic medals in track and field athletics. “Father” Järvinen raised and coached his four sons to world elite athletes. Akilles Järvinen won Olympic silver in decathlon in 1928 and 1932. Matti Järvinen became the best javelin thrower in the world in the 1930’s.